You are Cordially Invited to a reception in your honor!! 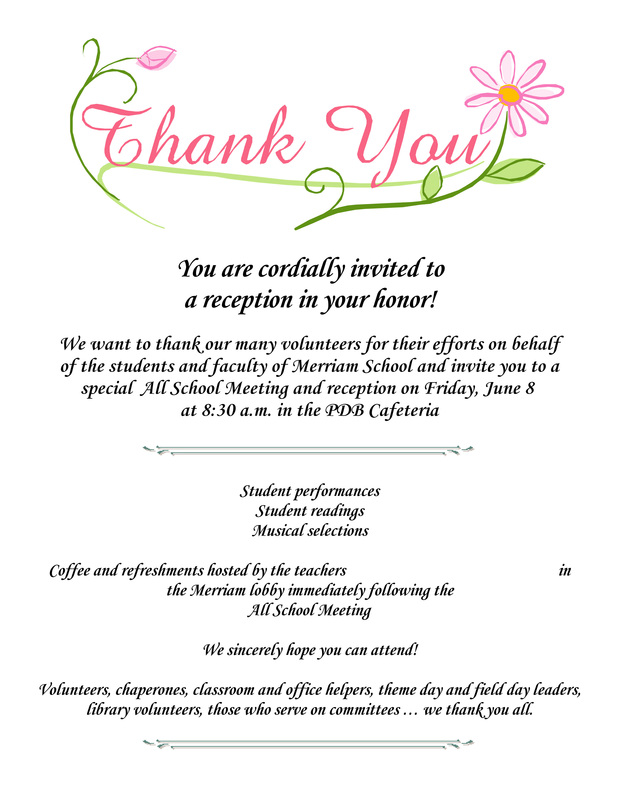 We want to thank our many volunteers for their efforts on behalf of the students and faculty of Merriam School and invite you to a special All School Meeting and reception on Friday, June 8th at 8:30 a.m. in the PDB Cafeteria. Coffee and refreshment hosted by the teachers in the Merriam lobby immediately following the All School Meeting. We sincerely hope you can attend! Volunteers, chaperones, classroom and office helpers, theme day and field day leaders, library volunteers, those who serve on committees….we thank you all! Camp Fair Directory and Registration – Help Wanted!